Riverbend Labradoodles is the home of Chad and Kristi Coopshaw, and our Labradoodle Family. With over 20 years of experience, we have shared our Labradoodle Puppies with families across this Country, and around the world. As an Authentic Australian Labradoodle Breeder, we offer our Riverbend Australian Labradoodle puppies in Miniature sizes (20-35lbs), Medium sizes (30- 45lbs), and Standard sizes (45-60lbs). Because of our years of experience and success with our English Style Labrador Retriever Breeding Program, our Riverbend Labradoodles are stocky, heavy-boned, and have a beautiful, blocky style of head that gives them a soft, intuitive expression. 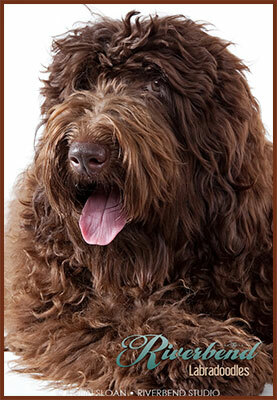 Riverbend Labradoodles is an Ohio Labradoodle breeder, a Founding Member Breeder of the Worldwide Australian Labradoodle Association (WALA), and a recognized Australian Labradoodle Association of America (ALAA) Breeder with Gold Paw Status health certifications. 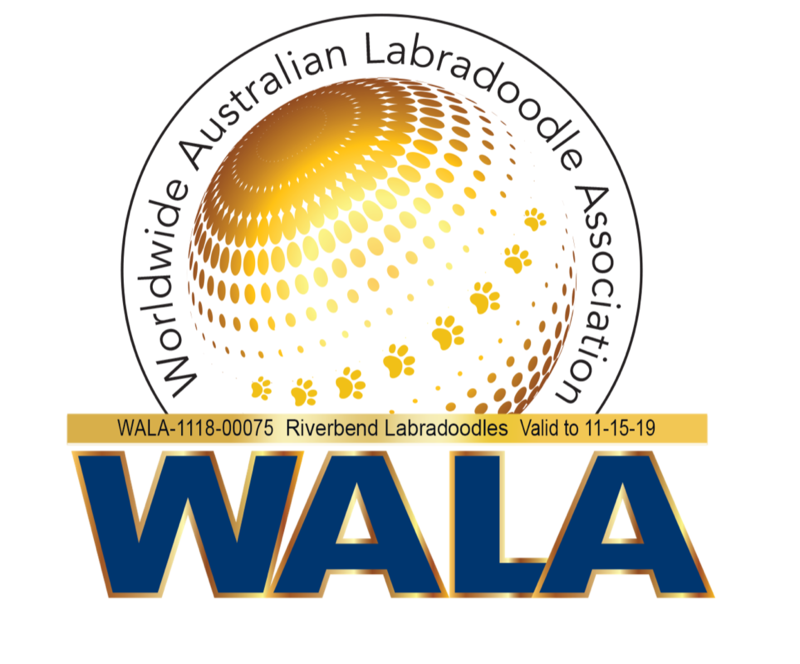 As a past ALAA Board Member, and a current WALA Founding Member Breeder and Board Member, we are proud to be involved with special projects focused on the development and health testing of the Australian Labradoodle breed. We are also proud to belong to the Better Business Bureau, and hold the A+ rating, the highest rating award. Our commitment to quality and accountability to these organizations offers peace of mind in purchasing one of our Australian Labradoodle puppies. We have shared our Australian Labradoodle puppies with families in Ohio, Indiana, Michigan, Illinois, Wisconsin, Pennsylvania, Texas, California, Florida, New York, and more. Our Labradoodles have allergy friendly coats that are non-shedding, and we are dedicated to helping people with allergies add to their family. Our Labradoodles are known to have a laid- back, easy-going temperament, and are great family companions. They are intelligent and easy to train, and typically finish at the top of their obedience classes. Here at Riverbend, we have made it our focus to protect the health and future, while maintaining the integrity, of the Labradoodle breed. 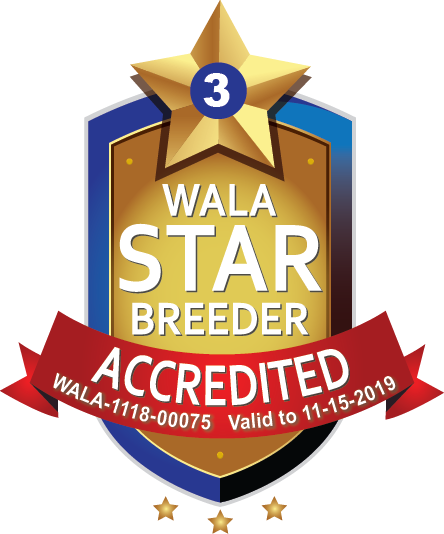 Our carefully planned breeding program is dedicated to Quality, not quantity. We believe it is of utmost importance to have OFA hip, OFA elbow, ACVO eye clearances, and also breed specific health clearances, as well as Champion Quality pedigrees within all of our dogs’ bloodlines, to ensure we have the healthiest Labradoodle Puppies possible. Take a look at Our Dogs. All of our Riverbend puppies are raised in our home for proper socialization and handling from birth. Our home is designed for our puppies to live with us, so we can provide a healthy environment, to build the foundation that will help them grow to their full potential. Paying attention to how a puppy grows, from the day he is born, is important for the very health and vitality of each puppy. And, we believe that the first eight weeks of a puppy’s life, is of vital importance in determining his later behavior as an adult. We share our Australian Labradoodle Puppies with loving caring families, and you can be confident that our puppies are handled continuously, are exposed to our everyday life, and everyday noises, to create a positive social experience that will enable them to become lifelong companions. We hope that you enjoy our website and find it easy to navigate, helpful, informative, and fun. If you have any questions or would like more information about this fantastic breed, please feel free to contact us by phone or email. We love sharing our Riverbend Labradoodles with others, and welcome all inquiries concerning them. Happy Yappy Birthday Savi‼️ It looks like you had a wonderful day! “Savi turned 4 today!! She is still my baby girl. She loves going to daycare and playing with other dogs! I am attaching some of her birthday pictures. She got to lick the batter spoon from her birthday cupcakes. Happy Birthday Savi, your a beauty. Is she from the Roxie/Amadeus litter 4 years ago? Our Teddy turned 4 on the 17th! What a beautiful girl! On a side note, I notice you use a harness. I've just gotten one for my girl to go out on walks with but it keeps sliding to the side. She always walk right by my side. Is there something I'm not getting right? Any hints would be appreciated! Riverbend Labradoodles shared a photo. We are so proud of the work Deputy Woody K9 (Forrest/Marley) and his fellow Therapy Dog Partners are doing in the FCSO Therapy K9 Program. If you haven't "Followed" them on Facebook, you should! www.facebook.com/FCSOTherapyK9/ They are now outlining their program and helping other Units across the country establish programs to help others in their communities! Here is an amazing article written about them, and please, share it with your community leaders too! What adorable photos of Jack (Noodle/Clark) and his sister Marlowe! Jack joined his family in North Dakota and hasn't skipped a beat! Thank you for the puppy update Carla! What a beautiful chocolate coat he has!!! We have a beautiful set of Riverbend Doodles too!